“Africa in America: Music, Dance, and Culture Magazine” represents as a primary resource for both professional African dance, music-based artists and art participants who are interested in the growing culture here in America while blending state-of-the–art visuals and using the cutting-edge fashions of today. These styles include the arts from North and South America, the Caribbean, West, Central, and Southern Africa. With a mix between “Dance Magazine” and “Essence”, “Africa in America: Music, Dance, and Culture Magazine” is dedicated to becoming the voice of a growing community of artists who have had little to no representation in the music and dance fields. Since African-based arts have held a huge part in social justice both in America and the Diaspora, “Africa in America” also is committed to continue this path by keeping our audience aware when it comes to community and organization building, grant and work opportunities, and many other ways that may inspire art locally and nationally. 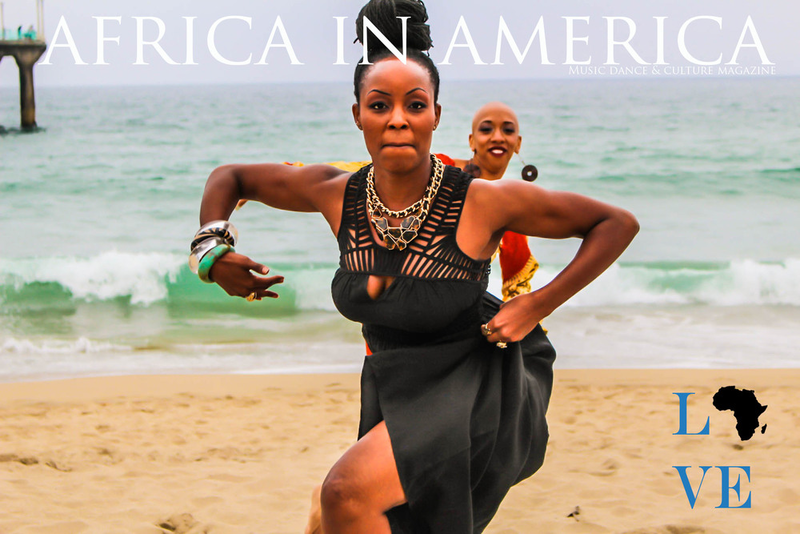 Every issue will address various platforms that need to be tackled within this African-based art form in America, and “Africa in America” will be filled with pages of the exquisite beauty of African Dance; bringing this culture to the mainstream through visual arts. If you are interested in being apart of our team, please contact The Mack Group at themackgroup@ca.rr.com. Kara Mack, a true ‘southern gal' got her start in Columbia, South Carolina, her birthplace, performing for youth ministries, schools and conferences. Since her move to Los Angeles, she has developed into a beautiful, budding artist. As a dancer she performed in several award shows including the 36th Annual NAACP Image Awards, the 2005 BET Awards, and the 2005 Billboard Music Awards. She has taught West African Dance and Dunham at Debbie Allen Dance Academy, and has assisted on the First & Second Annual African Dance and Music Festival. She was also an Artist-Residence for over 3 years for the renown “Theatre of Hearts” Program; a non-profit organization focusing on reaching the at-risk youth in Los Angeles through the arts. Also, for the past two years she has co-produced and directed the Fashion Extravaganza for Jewels Inc., a South Carolina charitable organization; whose mission is to inspire young people through the arts. Placing no limitations on her God given abilities, she also sings with JaJa Productions and has two albums currently out all over the world; her EP “Selah” and her debut LP “A Negroe’s Spiritual”. Kara Mack performs with Canne', an African dance troupe in Los Angeles, Swing Brazil (Afro-Brazilian Dance and Drum Company), and Balandugu Kan; a Traditional West African Drum and Dance Troupe where she serves as Artistic Director/Choreographer. She also just recently joined the world-renowned Viver Brasil; a music and dance company featuring Afro-Brazilian and Contemporary dance. She continues to work with major choreographers, like Fatima Robinson, for live performances by R. Kelley and the Clive Davis Pre-Grammy Party; and Jonelle Monae on American Idol. Her choreography is currently featured on three music videos that are shown all over the world this year, predominately in West Africa; including Ghana's "African Reggae Fever" (Rocky Dawuni), "African Thriller" (Rocky Dawuni), FIFA World Cup Official Song performed by Shakira "Waka Waka", and Senegal's number 1 song by Pape N'Diaye Rose. Having trained in all African styles with dance masters from Brazil, Cuba, West Africa and Central Africa, her goal is to master them all dances of the African Diaspora; while showing the unity within being so spread apart. Kara Mack is also a successful producer/choreographer that premiered two sold-out performances of “The Essence” on September 29th and 30th, 2012. Choreographed, written, and directed by Kara Mack, The Essence is a unique approach to the retelling of the multiple realities of Africa. For the first time on a Los Angeles stage, dancers and drummers from West Africa, Brazil, Cuba, and the United States united for a single purpose. "The Essence" utilizes traditional African performance genres to convey the historical, cultural, and spiritual connections between the three distinct pieces, appropriately titled "Essence," "Breakthrough," and "Liberation." It is apparent that performing is a "natural", as she communicates with the confidence and style of a seasonal professional. Because of her style, you will immediately grasp the seriousness of this artist; which reveals the graces of a young lady determined to make her own niche in dance and the musical arena. With her jovial spirit, Kara, through dance and song, expresses her love for the rhythm in music, which is why she embraces and continues to learn more about the different forms of African dance. Kara believes that through her gifts she can stir up the gifts in young people; renewing hope in their hearts, inspiring them to reach for the impossible. Kara Mack is truly an artist you must personally encounter.